Come join our international short term volunteer project (Work-camp) this is a very meaningful way to travel with a purpose and spend some weeks in Ghana's environment. Working and living together with other volunteers from around the world provides an excellent opportunity to make many new friends, learn about unknown places and culture, gain new skills and experience. Your time and energy can make a difference in areas where help is really needed. Building an education center for children in Peki, in the Volta Region. We aim to strengthen our community from within, through a combination of financial support, voluntary work and important related activities. We support a socio-economic re-balancing; helping people free themselves from the oppressive economic state they are in. Our volunteer opportunities aim at working, on a grass roots level with the individuals in our community, helping alleviate their struggle for health care, education and uplift their standard of living gradually. We are located in Peki-Avetile, Volta Region, between GOVCO (Government Training College) and the Peki Government Hospital. It is about 2 and half hours’ drive from Accra. 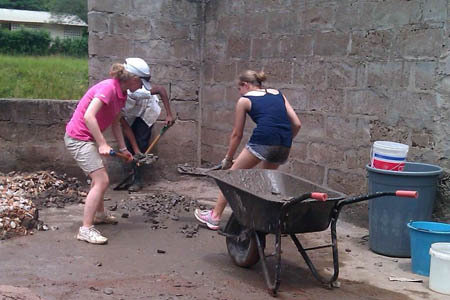 Accommodation: Volunteers will be accommodated in guest houses or other host family houses within the community. Application process and requirements: No previous skills are required to participate in projects. flexible time frame in creative projects. Whenever volunteers arrive and at whatever time, we will be waiting at the airport for them with all the details for their project fully prepared. This flexibility also allows people to combine programs, to live and work with friends, and to work at the placement which inspires them most.